Our Website allows visitors to submit information via Self-Service forms (Claim Forms, Employment and Contact request). The information submitted via the Forms is encrypted – an option is available for claim forms to be downloaded in PDF format for faxing. Should you be concerned about confidentiality of the claim information, this would be the recommended method. 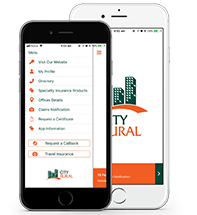 Information collected via on-line forms is sent to our offices via EMAIL (not encrypted) and is also stored on a database which is accessible by City Rural Insurance Brokers Pty Ltd staff only (password protected). We may occasionally notify you about new services and special offers, events or articles we think will be of interest to you. We may send you regular updates by email or by post on insurance matters. If you would rather not receive this information or do not wish to receive it electronically, email or write to us. We may use your information internally to help us improve our services and help resolve any problems. We strive to maintain the reliability, accuracy, completeness and currency of the personal information we hold and to protect its privacy and security. We keep personal information only for as long as is reasonably necessary for the purpose for which it was collected or to comply with any applicable legal or ethical reporting or document retention requirements We hold the information we collect from you initially in a working file, which when completed is electronically imaged and stored, after which any paper is destroyed in our onsite shredder. We do not sell, trade, or rent your personal information to others. We may need to provide your information to contractors who supply services to us, e.g. to handle mailings on our behalf or to other companies in the event of a corporate sale, merger, re-organisation, dissolution or similar event. However, we will do our best to ensure that they protect your information in the same way that we do. If you wish to access or correct your personal information please write to our managing director at City Rural insurance Brokers Pty Ltd, PO Box 7138 Hutt St Adelaide SA 5000.